For new homes and planned communities across the United States, builders often seek pre-fabricated stairs to compliment specific styles, while bringing practicality, efficiency and comfort to a space. Though some assume these staircases to be overly simplistic, production stairs can feature special designs and elements that translate personal style and flair. Thus, while stairs are standardized, they have the capacity to make a statement when desired. In a traditional, architectural sense, staircases connect living spaces. Yet, even straight production stairs can convey the lifestyle and individuality of a home or business owner, given precise planning and craftsmanship. Thus, it’s not always about artistic accents, edges or curves. It’s about creating a quality staircase that feels secure and “walks comfortably.” Given the right space, a boxed stair with constructed rail walls, though simple, becomes a complementary stair design that draws attention to surrounding structures and decor. Even so, there are instances in which production homes require some level of customization. 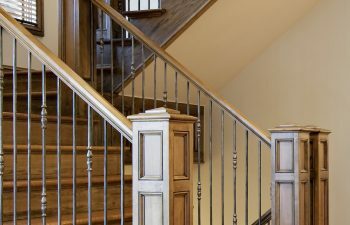 One example is a builders’ series that incorporates decorative components such as scroll and basket iron spindles, a double bullnose tread, stringers or post-to-post railing and painted risers. These staircases maintain some consistency from home to home, yet they appeal to potential buyers in regards to choice and preferences. Of the 17 national production builders, Southern Staircase/Artistic Stairs has partnered with 14, creating over 140,000 straight staircases each year. Because our project management team understands the need for exceptional value in staircase designs and templates in order to generate consistency in manufacturing, installation and delivery, we remain a trusted source for developers and production home builders from coast to coast. Using reliable processes to streamline production, Southern Staircases/Artistic Stairs takes an industry-leading approach to production staircases and other services. Our team understands the importance of key measurements and engineering, including how these relate to building codes, regulations and other standards. In turn, we’ve invested in specialized training to guarantee efficiency and on-site safety. From inspiration to development to installation, we offer the resources needed to deliver the highest quality project possible. To take neighborhoods and communities to the next level, our team of talented experts would like the opportunity to partner with you when it comes to production stairs. From standard to custom production stairs, we have remained a premier source for pre-fabricated residential and commercial staircases of all styles and materials. With over 30 years of experience, we share high expectations for a top quality finished project. Call Southern Staircases/Artistic Stairs to discuss your production staircase needs today!